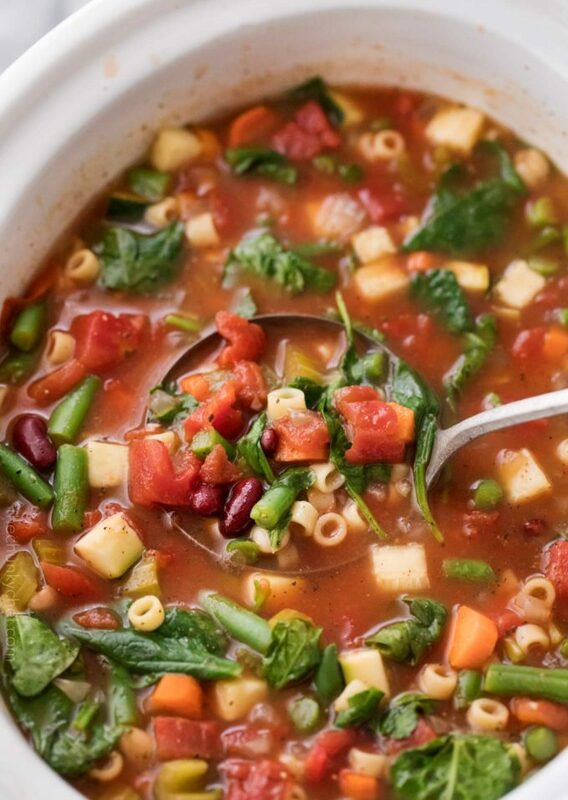 Incredibly flavorful and rich, this minestrone soup is every bit as hearty as it is beautiful. Made easily in the slow cooker, this soup is perfect for a busy weeknight! 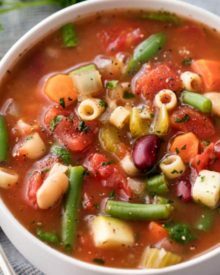 Made with minimal effort, this minestrone soup is one of the most flavorful soups I’ve ever made! Full of protein and fiber rich beans, nutritious vegetables and filling pasta, it’s a complete meal in a bowl! How’s your Spring going so far? Ours has been absolutely crazy, with snow storms hitting us several times within the last two weeks. Now this week it’s cold and rainy. BLAH!! The good news is, it’s still soup weather! Honestly though, I still make soup year round… it’s just great comfort food. 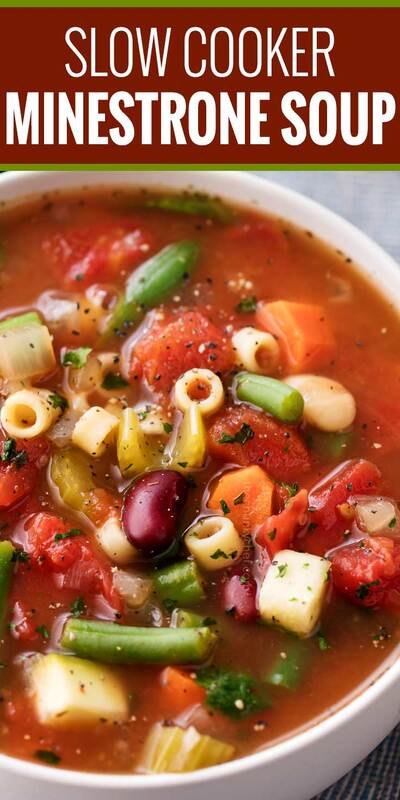 Especially this minestrone soup. I’ve made a lot of soups over the years… some of our favorites are tomato basil, zuppa toscana, and beef barley… but this one, it might just be my absolute FAVORITE!! Normally vegetable soups always leave me feeling hungry about an hour after. But this one doesn’t do that to me; it’s hearty, rich, and FULL of flavor. 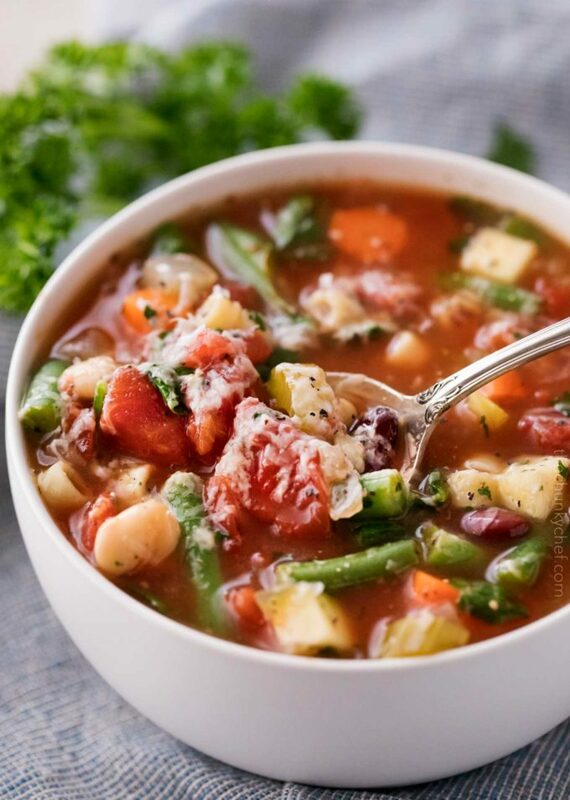 Minestrone is typically a vegetable soup, usually with beans, and pasta. Traditionally ditalini (the small little tubes) is used, but mini shells, mini penne, or any other really short pasta will work. In many ways yes! 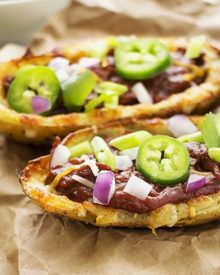 It’s low in fat and calories and loaded with healthy vegetables. 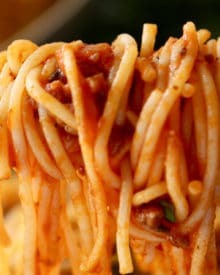 If you’re following a low-carb way of eating, the beans and pasta will make this higher in carbohydrates. 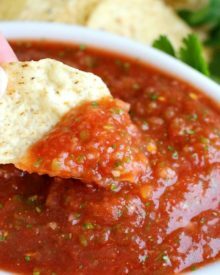 Not technically, but from looking at other copycat recipes, it has extremely similar ingredients, so it will probably taste pretty close. I’ve never actually had the minestrone soup from Olive Garden, so I can’t say with certainty how close the flavors are. Try it and let me know! 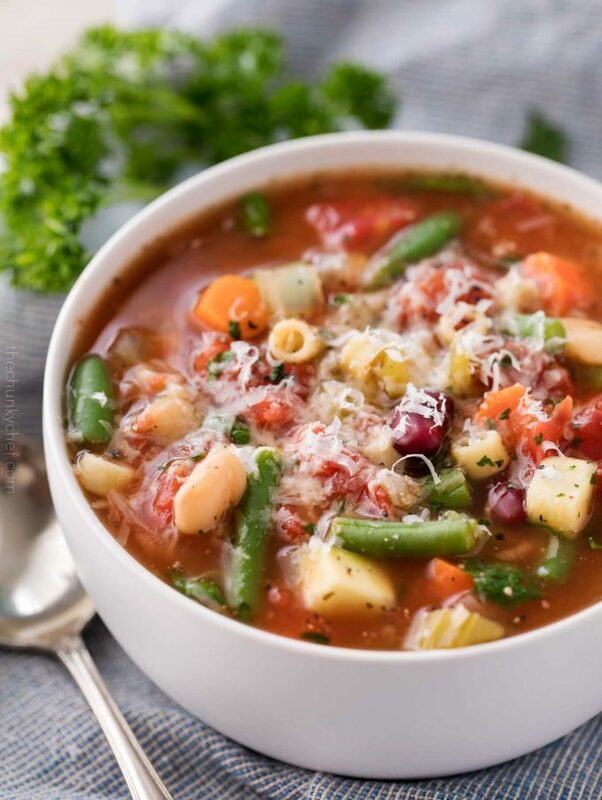 Even though we may be heading into warmer weather, I hope you give this hearty and comforting minestrone soup recipe a try… I know you’ll love it!! Try this soup with my no-knead artisan bread or semi-homemade garlic bread for a great treat! 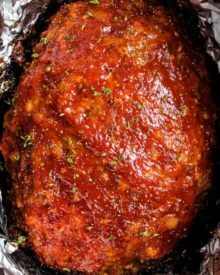 Large slow cooker – I have the 6 and 8 quart version of this slow cooker and it works amazingly well. I love that the lid latches down. Vegetable base – this is what I mean when I say vegetable base, it adds SUCH flavor to soups and stews. 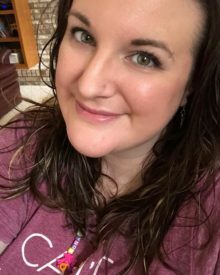 Your grocery store might have it in stock, but in case it doesn’t, this link is to the exact version I use. 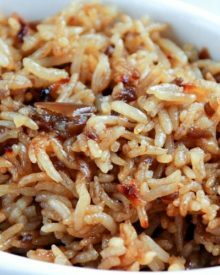 Add first 15 ingredients to 6 quart or larger slow cooker. Stir to combine, cover, and cook on LOW for 6-8 hours, or HIGH for 3-4 hours. 30 minutes before you want to serve the soup, add zucchini and ditalini pasta, stir, cover and cook on HIGH for 20-25 minutes. 5 minutes before serving, add in frozen green beans and baby spinach, stir, cover and cook on HIGH for 5 minutes. 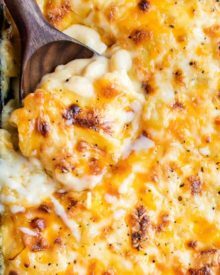 When serving, if desired, grate parmesan cheese over the soup and enjoy! As written, the green beans are semi-crisp. If you prefer softer green beans, add them when you add in the zucchini and pasta. Great recipe! I’m to much of a carnivore to not add a pound of ground beef to it! Came out delicious. ..nomnom. I woke up to snow in Indiana today so I thought what a perfect day for soup!! 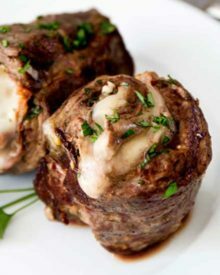 This recipe is wonderful and perfect!! Great suggestion with the vegetable base, the soup is absolutely delish! I’ll have to freeze some for later. Thank you! Baked in oven tonight. Can’t wait to taste it tomorrow for Easter dinner. It looks yummy! Thanks for the recipe because we usually purchase Honey Baked Hams for holidays. What a GORGEOUS pot of soup! Can’t wait to try this one! This is one of my favorite soups! Thanks for making it a slow cooker version! 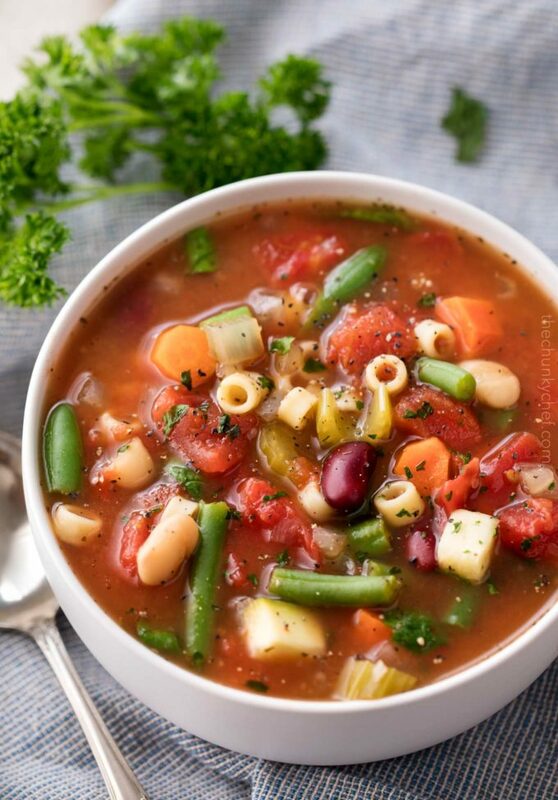 Minestrone soup is one of my comfort foods. Nothing beats a bowl of soup that has been slow cooking all day. Comfort food at it’s best! That looks like one hearty bowl of soup! Love all the veggies! !